As you can see from the following sketches, a low blade directs the cutting force in a plane close to parallel to the table. This increases the chance of kickback. In the lower sketch, a high blade directs the cutting force at a more downward angle. This tends to hold the wood down to the table instead of forcing it backwards. True, more blade is exposed, but a spinning blade is dangerous at any height. The high set blade gives a cleaner cut with less tear-out, a plus. kickback comes from the piece being twisted into the back of the blade, does it not? If anything different happened with a high blade, wouldn’t it just potentially just change the angle it comes flying off at? If twisting is the problem, then the wood is twisted and following the surface of the table. The height of the blade doesn’t affect anything except for less chance of kickback and a cleaner cut. Please note the phrase: “less chance of kickback”. Kickback is always present if you don’t observe the rules of cutting. You have to resist the urge for the wood to kick back by applying greater force on the wood. If the force on the wood wants to exert 20# back at you, you have to apply more than 20# to resist kickback and complete the cut. It’s a matter of action and reaction. All of this may sound theroitical. I look at saw safety from many different angles and try to understand why bad things happen. My approach is not to hamper the saw with safety devices, some that may work and others that are questionable, but to understand the forces behind the cutting action. I think if you and I can understand the physics of the saw and cutting, can we make the saw safer. Number one in saw safety is understanding what goes on, not relying on a device to keep us safe. I would and am disinclined to have the blade higher because it puts more blade into the board which would seem to increase the chance of the board pinching the blade. Also, higher blade can be the difference between a dozen stitches and a reattachment. I understand what you’re saying, Mr. Ron. That’s exactly what conventional wisdom would tell you to do. The only way to find out is by experimenting. I don’t think that these guys are talking about running a warped board through the table saw. I don’t know if its happened to you, but mid-way through a cut on a perfect-looking board can turn dangerous real fast. Sometimes there is energy (for lack of a better word) built up in that board and it is released after it has been cut. That results in twisting and even worse, binding on the out feed side of the saw. Then, that could result in kickback. I keep my blade low to keep it from over-heating and to avoid kick back. Less blade…. less friction. Stay on it and let us know how it goes. Be safe. And I thought that blade height was pretty much settled? The “rule” I’ve always heard is the gullet just clears the top of the piece being cut. Obviously that would be in-between the “low blade” & “high blade” in the sketches. While there may be some theoretical validity to what height would most/least encourage kick back, so many other factors are in play. If we were all using our appropriate safety equipment, ie blade guards and riving knives, this would all be moot. That said, I never use the guard and rarely rip without the knife. Blade height is with the entire tooth exposed and no more. Probably a thousand different answers on this one. I usually try to raise the blade until I see half the gullet (or a little more). ChuckV- That makes a lot of sense. Could you post a link to the rest of those “tips” from Forrest? Please? I am of a very different opinion. I think the blade should be about 1/4” above the surface of the stock, at most. The wood can’t pinch and bind on the saw plate, because if it wants to, it gets cut off by the rising back teeth. A higher blade means the vector of the force from the rising back teeth is lifting the work off the table, which is the first step in a common kickback scenario. The rising back of a lower blade is mostly pushing the stock back toward the front of the saw – which could be a problem except that the teeth are removing material that wants to interact with the blade. It’s still very important to hold the workpiece down, with a fixture or push stick. As far as tear-out, that happens when you try to cut wood fibers with nothing behind them to back them up and they break off. A higher blade means the cutting vector at the front, where the bottom of the wood meets the blade, is more straight down. This means wood fibers are being pushed toward air and the ones at the very surface blow out. If the blade is lower, then the cut is more back toward the infeed direction, which means the wood fibers have more wood behind them and thus less tear-out. In fact, for tear-out prone materials, one technique is to lower the blade to 1/8” or so, scoring the bottom surface with a very low angle cut. Then raise the blade (without moving the fence) and run the stock through to complete the cut. 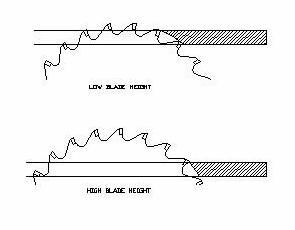 Some industrial saws have a separate very low scoring blade in front of the main blade. Finally, there’s the obvious point about a higher blade being able to do more damage to an errant body part. The only downside I can come up with for a low blade is, on saws without a proper riving knife, that the gap between the back of the blade and the front of the splitter is bigger. This means there’s a longer danger zone where you have to be careful of the work pivoting and kicking back before the leading edge reaches the splitter and is prevented from doing so. There are commercial inserts with little tabs (or you can make your own) that help with this issue. Something that has occurred to me as I have read this post is to compare the table saw to the radial arm saw. Think about it – the radial arm saw effectively has its blade set at the “low height” as Mr Ron describes it. For most of the past year, I have been using a radial arm saw predominantly for cross cutting of pine (i.e. soft wood). I have experienced some tear-out on occasion, but usually nothing significant. I have occasionally experienced a situation where the blade has bitten into the wood and pulled itself forward faster than desired, leading to the blade stalling, but I would say that every one of those occasions were operator error, not due to saw setting in any way. Now here is the interesting bit. Very occasionally, I would need to cut a short, but wide, piece of wood along the grain using the RA saw. I learned that this was a particularly risky operation because the saw really tried hard to bite into the wood and pull its way forward faster than desired. I discovered that I had to be conscious of this and work to specifically avoid it. Now this may be because the RA saw has a cross-cut blade installed, and certainly I always attributed this behaviour to that rather than to blade “height”, but how many of us have and install dedicated rip blades to our table saw? When cross-cutting, you could decide which height to set the blade based on hardness of the wood, the tear-out that you experience and what guarding you have in use on your saw. It would seem from the instructions that ChuckV posted above (thanks Chuck, most useful) that as long as you are not experiencing tear-out, and you have guards in place, high might be better.